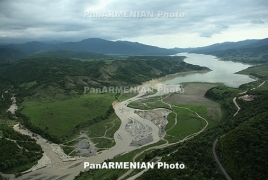 PanARMENIAN.Net - PACE Social Affairs committee approved and published an anti-Armenian draft resolution on the situation around Sarsang Reservoir. The document titled “Inhabitants of frontier regions of Azerbaijan are deliberately deprived of water,” is based on the report by Milica Markovic. The resolution cites the 1992 UN Water Convention, reminding all the member states of the Council of Europe that the right to water is essential to life and health and thus constitutes a prior condition for the enjoyment of other human rights. Among the Assembly’s “requests” are the withdrawal of Armenian armed forces from the region concerned; access by independent engineers and hydrologists to carry out a detailed on-the-spot survey; global management, throughout the catchment area, of the use and upkeep of the Sarsang water. The resolution calls on the Armenian authorities to cease using water resources as tools of political influence or an instrument of pressure benefiting only one of the parties to the conflict.